Ho, ho, ho! In this weeks episode, Joel and Chris discuss the importance of writing skills. The guys explore the implications of writing skills and how to become a better writer. Don’t write good, write well! You can learn a ton from the masters of writing and it will improve your own writing. Write every day, and no, emails don’t count. Let Chris and Joel walk you through the steps for a successful coffee meeting. From how to ask for the meeting, to the steps you should take after the meeting, and everything in between. 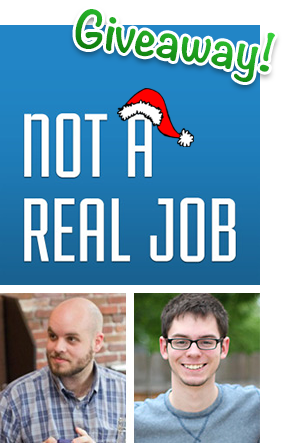 Win a free subscription to Not a Real Job! 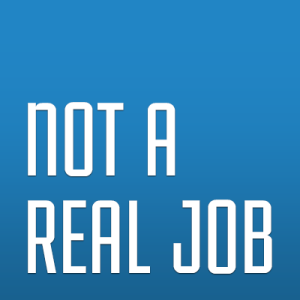 As you probably know, Not a Real Job is Not a Free Podcast. We charge $40 per year, which gets you one episode every week for less than a dollar per episode. Not bad! However, in the spirit of the holiday season, we’re giving away a few subscriptions to you, random Internet denizen. Entering is easy: just follow us on Twitter and tweet us a question about social media marketing, digital entrepreneurship, or related topics. We’ll pick two questions from the bunch, and give the authors of those questions free subscriptions to the show good for one year (again, a $40 value). We’ll also answer the questions in upcoming episodes of the show. The contest is running from today (Monday, December 9th) through Monday, December 16th. That’s a full week to follow us and cook up a great question. “Now hold on Chris/Joel,” I hear you say. “I don’t have a Twitter account. Can I still enter?” The answer is an emphatic yes, you most certainly can! Hop on over to Chris’s website, where you can enter to win by submitting a question and email address (you do have an email address, right?). We’re giving away four subscriptions in total: two from our Twitter entries, and two from entries at Chris’s site. You can enter multiple times, in multiple places! Just don’t use the same question twice. Every question you submit should be unique. Your Twitter account must be public. If it’s private, we won’t be able to see your submission. Similarly, you have to include the @NARJcast handle in your post. We will be judging based on question quality, so don’t submit a stupid question (no pressure). Good luck, and may the best tweet win! In this episode, Joel and Chris discuss the shift from the assembly line workplace to the modern day, virtual workplace. Learn how to effectively manage employees in this transition.